For those of you who use Zillow as their go-to real estate portal, you may have noticed that we had a wild and wacky weekend – and the party is still going! It was on May 1st that Zillow started uploading our listings directly from our MLS, Sandicor. The new system prevents agents from inputting new listings, or marking our existing listings as pending. Coldwell and Berkshire – they both had their corporate direct feeds set up before May 1st, and it looks like they are running fine. Sotheby’s – some new listings have been uploaded since Friday, and some haven’t. No rhyme or reason as to who was affected. 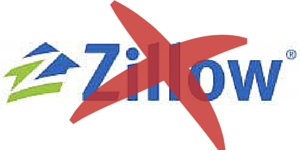 It looks like all other companies are NOT having their listings uploaded to Zillow, nor are they being marked pending automatically like they were previously – and you can’t do it manually either. I did open house in La Jolla both Saturday and Sunday, and I had visitors on both days asking why my listing wasn’t on Zillow. The problem previously reported here about how listings get deleted on Zillow once they are marked pending in the MLS has not been resolved. More and more people are inputting their listings on CRMLS (the SoCal alternative MLS), which leads to duplicate listings which screw up the MLS stats but at least the listings are accurate on Zillow. The mix-up is isolated to the San Diego market, and could be part of the uneasy union between Zillow and Sandicor, who was a reluctant partner in the past. But both entities stated publicly that this auto-upload package was good for all, and a big step towards accuracy on Zillow. We’ll see how long it takes them to fix it – today is Day 6. A Maryland woman is going to jail after she posed as a real estate agent and stole jewelry from houses, including an irreplaceable heirloom. Sally Spaisman, 58, was sentenced Wednesday to one year in jail and five years of probation, the Montgomery County State’s Attorney’s Office says, for stealing more than $82,000 worth of jewelry from about 12 homes in the Bethesda, Chevy Chase and Potomac areas. She pleaded guilty to the theft charges after she combed the Internet for expensive homes on the market, showed up at the open houses, then stole expensive jewelry, prosecutors said. Tracy Glesby is a real estate agent. No doubt she’s good at her job. But D Magazine did not name her a Best Real Estate Agent in either 2011 or 2012, as one would be led to believe by her Facebook page. As I say, that conversation happened last Wednesday. Yet the logos remain. That there is what you call stick-to-it-ness. You put your house on the market, and it doesn’t sell the first day? Tracy Glesby isn’t going to give up. To make the sale, that lady is going to do whatever it takes. An excerpt from the Will Carless article at the Voice of San Diego – hat tip to several readers! The Poway Unified School District may be California’s poster child for exotic school bond financing, but it is by no means alone in San Diego County. As I detailed in my story yesterday, Poway Unified borrowed $105 million last year using a form of financing called a capital appreciation bond. The district won’t start making payments on the loan until 2033, and by the time it’s paid off in 2051, taxpayers will have paid back almost $1 billion, or almost 10 times the original loan. As I point out in my story, capital appreciation bonds have become increasingly popular across the state, since they allow school districts to borrow money now without raising taxes on current residents. Instead, the burden for paying for the bonds is pushed to future generations, who are left on the hook for loans that are wildly more expensive than conventional bonds. I’ve been digging through public records to try and find some other examples of these bonds in San Diego County. I haven’t come across anything quite as extreme as Poway’s deal, but I have found some bonds with very similar rates of interest and repayment schedules. The deals elsewhere in the county mirror Poway’s deal in other ways, too. All three districts had recently passed bond measures to complete previous renovation and modernization efforts that were behind because of cost overruns and delays. The three bond measures, passed in 2008, all made the same promise to voters: Tax rates would stay the same. I think this should be considered when making a decision about homebuying! For crimes associated with trashing their foreclosed Winchester home, a former San Diego police officer and his wife each received a sentence of 270 days in jail and five years on probation. In rendering the sentence, Judge Mark Mandio at the Southwest Justice Center decided against handing out the maximum punishment of four years in prison to Robert Conrad Acosta, 40, and Monique Evette Acosta, 37. A jury convicted the couple in May of defrauding their lender by ripping out fixtures in the home and attempting to sell them after they were kicked out in June 2010 for failing to make mortgage payments. Mandio cited their lack of prior convictions and the damage that long-term incarceration could do to them and their family as reasons for giving them lighter sentences. Apparently incensed that they were getting booted from the home on Via Laguna, the Acostas tore the house apart, taking nearly everything of value and leaving the property in shambles. Jurors saw a video and photographs taken after the family’s departure that showed piles of rubble, empty doorways where doors were removed, damaged rock facings, spray-painted walls, tile grouting saturated with black hair dye and loose wires sticking from walls from which light fixtures had been taken. The kitchen literally was gutted for everything of worth. The swimming pool was filed with cypress trees that had been cut down and dumped there along with other debris. The Acostas contended they had a right to take the items from the house because they had purchased them. However, the deed of trust that ran with the outstanding loan on the property prohibited the removal of permanent fixtures regardless of who installed them, according to evidence presented at trial. Investigators discovered Robert Acosta had advertised many of the items for sale on the online marketplace Craig’slist and the couple were arrested. While awaiting trial, Robert Acosta resigned from his position with the San Diego Police Department. During Friday’s sentencing proceeding, the judge rejected requests by the Acostas’ defense attorneys for a reduction in their convictions from felonies to misdemeanors. 1. Sales are all over $1,000,000. 2. The eyesore has gone away. 3. The low-income housing will be complete. General Hospital” heartthrob-turned-real estate agent Stuart Damon will be returning to the small screen with the show “Luxury Lifestyles TV,” which’ll air on Fox 11 starting March 6 (in the odd 11 am time slot). The show features Stuart and his son Christopher cracking wise as they tour local high-end real estate, including downtown’s Watermarke and the Ed Niles-designed salad spinner in Beverly Hills. When armored vehicles knocked down the house on 28th Avenue S in St. Petersburg on Monday, it climaxed an hours-long gunfight that claimed the lives of two St. Petersburg police officers and the wanted felon who shot them, Hydra Lacy Jr. It was also the last echo of the frenzied house-flipping that lured Lacy and millions of other investors during the nation’s real estate boom. The Crayola-orange dwelling at 3734 28th Ave. S was the only house among seven that Lacy bought between 2004 and 2007 that did not end up in foreclosure. But like all the others, its flattened remains are testament to a bust that has hit St. Petersburg’s Midtown area especially hard. A Newport Beach man was arrested Wednesday after an attempt to regain possession of the home he claims his family was wrongfully evicted from 16 months ago. Rene Zepeda, 72, was accompanied by his attorney and several Newport Beach Police officers as he made his way to the back yard of the spacious home at 19 Crystal Cay and, wielding a hammer, broke a window to gain entry. Officers promptly arrested Zepeda and attorney Mike Pines for trespassing and carted them away in a police vehicle. Located in the gated and luxurious community of Crystal Cove, the 5-bedroom, 4,400-square foot home is on the market for $3.8 million. It’s an unlikely symbol of the brewing confusion surrounding foreclosures. Rene Zepeda and his wife Otilia purchased the home in 2008 after “years of sacrifice and hard work,” she said. Rene claims the lender, Bank of America, then raised the interest rate on their mortgage, causing the family to fall behind on payments. Attorney Pines argues that because the foreclosure was hastily pushed through, the homeowners were denied the right to a jury trial and to present evidence in court. Public records show that the home was foreclosed on July 8, 2009; Pines says the couple has been fighting a legal battle ever since and finally resorted to this dramatic gesture because the house is now for sale. Gary Kishner, a spokesman for JPMorgan Chase, said the homeowners lost the home 15 months ago after not making payments on the mortgage and that Chase now owns the property.